Courtney Lawes will start at six when Saints clash with Clermont Auvergne in the European Challenge Cup quarter-final on Sunday evening (kick-off 6pm UK time). Lawes picked up a calf problem during England's Six Nations defeat in Wales in February, but he has been in full training this week and is ready to return to the starting line-up at Stade Marcel Michelin. The influential forward takes the place of Jamie Gibson, while Lewis Ludlam is also back in the back row, replacing Heinrich Brüssow. Gibson and Brüssow are both on the bench. There is one change to the backline that did so much damage against Leicester Tigers last Friday as George Furbank comes in for Ahsee Tuala at full-back. Alex Waller will skipper the side as he returns at loosehead in place of Francois van Wyk. Teimana Harrison, who scored a hat-trick against Clermont in Saints' 48-40 pool stage defeat in France in January, again starts at No.8. 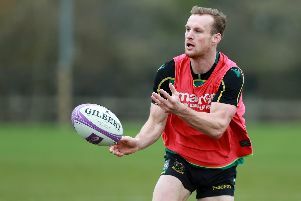 Andy Symons (knee), Harry Mallinder (knee), Mike Haywood (knee), Dylan Hartley (knee), Ehren Painter (calf), Paddy Ryan (knee), James Haskell (toe), Fraser Dingwall (ankle) and David Ribbans (ankle) are sidelined.